The Indian Air Force was officially established on 8 October 1932.Its first ac flight came into being on 01 Apr 1933. It possessed a strength of six RAF-trained officers and 19 Havai Sepoys (literally, air soldiers). 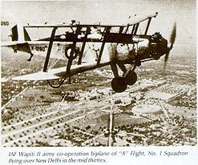 The aircraft inventory comprised of four Westland Wapiti IIA army co-operation biplanes at Drigh Road as the "A" Flight nucleus of the planned No.1 (Army Co- operation) Squadron. Four-and-a-half years later, "A" Flight was in action for the first time from Miranshah, in North Waziristan, to support Indian Army operations against insurgent Bhittani tribesmen. Meanwhile, in April 1936, a "B" Flight had also been formed on the vintage Wapiti. But, it was not until June 1938 that a "C" Flight was raised to bring No. 1 Squadron ostensibly to full strength, and this remained the sole IAF formation when World War II began, although personnel strength had by now risen to 16 officers and 662 men. President Dr Rajendra Prasad presented the President's colours to the Indian Air Force on the occasion of its 21st birthday in New Delhi on April 1, 1954. About 1,500 officers and airmen, representing every IAF unit in India, were drawn up for the colours presentation parade in front of about a hundred aircraft of various types, including Jet Vampires and Ouragans (Toofanis) and the latest acquisition, the Helicopter. Among those who watched the presentation, which was made in recognition of the meritorious services rendered by the IAF to the country in war and peace, were Prime Minister Nehru and Cabinet Ministers, Diplomats, Members of Parliament, Service Chiefs and the families of Service Personnel. The Indian Air Force is the second service to be presented the President's colours. The Indian Navy received them in 1952. On the eve of relinquishing command of the Indian Air Force, Air Marshal G. E. Gibbs in his Order of the Day' says: 'On December 10, 1951, I took over command of the Indian Air Force and at midnight on March 31st the command will pass from me to Air Marshal Mukherjee. April 1, 1954, will be a great day for the IAF, when the first Indian C-in-C, an officer of such very fine qualities, takes over. Adapted from The Hindu dated 02 Apr 1954. IAF has Two types of Jobs. One is in Officer Cadre and Second is as an Airman. Airman's are selected through Central Airman Selection Board.The role of CASB is to carry out selection and enrolment through 14 Airmen Selection Centes, spread all over India. These centres are under the direct functional control of CASB with Admin control and support by respective Air Commands.